A foreword on CRL’s German-related collections, resource development, and scholarly research using CRL materials. A profile of Germany’s Network of Expertise in long-term Storage (nestor) project and a collaboration to define and document the salient characteristics of robust digital repositories. An update on German-North American Resources Partnership (GNARP) projects and activities. Selected primary and secondary sources, with links, highlighting German colonial activities and foreign affairs in Africa, the Pacific, and other areas. A diverse sampling—with numerous digital and catalog links—of CRL microform collections that support research and teaching on German history and culture. A short list of Germany’s trendsetting 19th century illustrated periodicals, with background and links. A scholar’s perspective, derived in part from CRL collections, on the impact of German colonialism on modern German cultural norms. 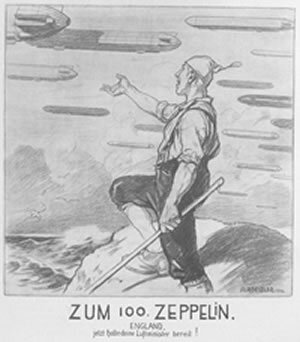 World War I propaganda forewarning England of Germany’s Zeppelin fleet, from issue 3691 of Fliegende Blätter (1916). From CRL collections.